Note: I will include the stats and sect information in coming days as I release sections of Gazetteer chapter and NPC chapter. If you have trouble finding anything in the this when it is complete or if anything important appears to be missing please contact me via the form to the left and I will make sure to fix the issue. The War of Swarming Beggars doesn’t assume a specific flow of events, or a sequence of scenes. It presents a situation, with stark NPCs, and the players can react to that however they like. It is a living adventure, where the Non-Player Characters adapt and respond to player action accordingly. The players are plunged into the midst of bloody feud between Southern Hill Sect and Twin-Fisted Eagle Clan. Exactly how they get drawn in can vary, but how the adventure unfolds depends on who they ally with, what actions they take, what happens on daily event rolls and where they explore. There is not an “Adventure” written in advance because the adventure is discovered in the course of play. However, there are still likely courses of action that could occur. The most likely scenario is the players get drawn into the War of Swarming Beggars through the manipulation of Twin-Fisted Eagle, who seeks an alliance with brave and powerful heroes. Then once they are drawn in, they need to use their wits and brawn to survive and help Twin-Fisted Eagle defeat Yellow Mantis, leader of Southern Hill Sect. They will contend with Killer Squads and intrigue. They can also explore and help find new allies, weapons, and other resources to increase their side’s chances of victory. The most coveted object, would be the Thousand Painful Deaths Flower at Iron Temple. But it is a dangerous place, rumored to be haunted. Of course, they can ignore this altogether and just explore the area. 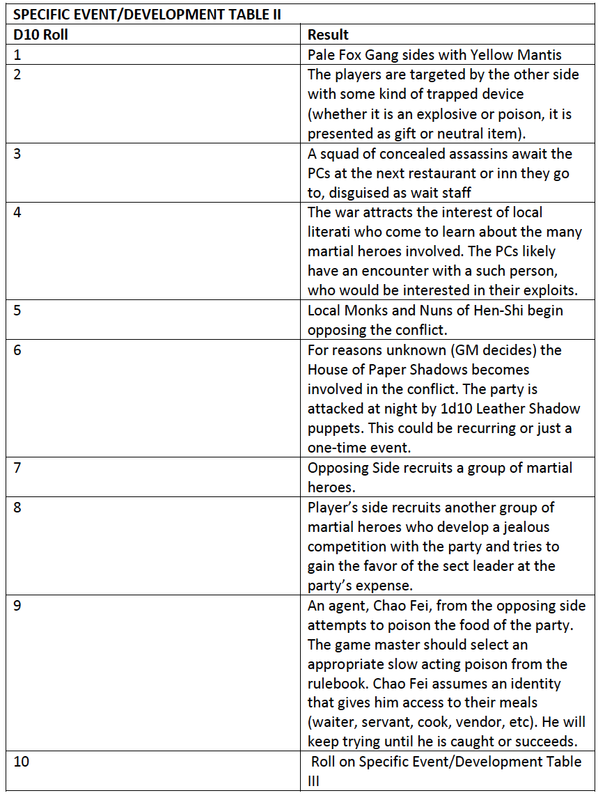 The Gamemaster can add complexity to the adventure by bringing other sects into the conflict (either sects from the core rulebook, the Sects of the Martial World Books, or of the GM’s own devising). 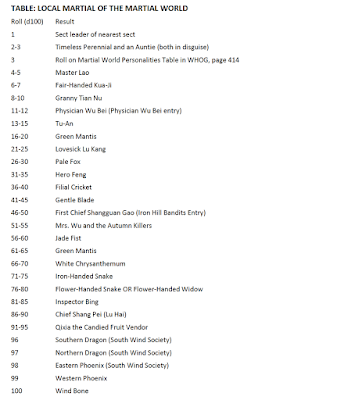 If you use the Sects of the Martial World Books, the Crocodile Sect and Silken Robe Society are good fits. The daily event tables also account for this, bringing other sects in automatically on certain rolls. This adventure assumes player characters acting in their own interest. But it also assumes the existence of NPCs who act with intelligence or at least force of will. Boldness is often rewarded, but so is caution. If the characters take initiative and march against Southern Hill sect by crossing the River of Swarming Beggars for example, you can be sure Yellow Mantis will take steps to ambush and use this maneuver against them. 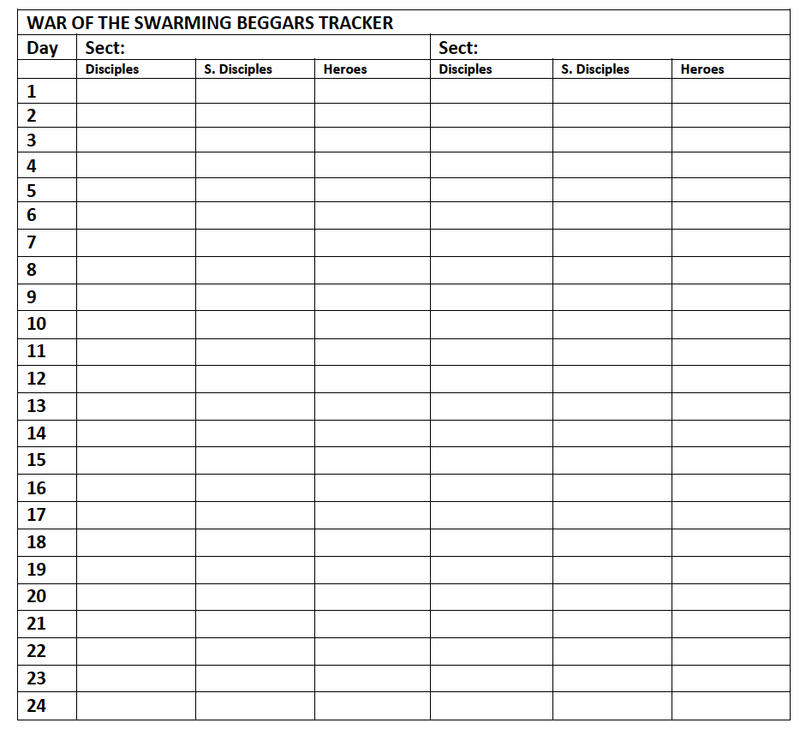 This chapter provides a number of tools for managing the War of Swarming Beggars. These are optional and a greatly simplified approach is offered at the end. We will also be including a simpler approach to sect conflict in the Sons of Lady Eighty Seven book. Twin-Fisted Eagle always found Yellow Mantis of Southern Hill Sect haughty but tolerable. The two groups respected each other’s territory and never made any overtly aggressive moves toward each other. However, four months ago, Twin Fisted Eagle’s first son, Tu-an, led a group of disciples into He Dong, a village on Southern Hill’s side of the river. It was late, they had been drinking, and things got out of hand. Tu-an and his men grabbed some locals from the Pale Brook Inn and used them for target practice. They were not trying to harm anyone initially, just firing arrows above their head. Then Tu-an boasted that he could slice off the arms of five men in one clean cut. He attempted to prove his boast by lining up five locals, then leaping in the air and throwing two swords on either side, slicing off the arms of the first man. His men laughed, saying he only managed one. Furious at their ridicule, he took a sword and proceeded to chop the arms off every man in the village. Tu-an and his men left the village and didn’t think about the incident for some time. Three weeks later, Yellow Mantis and his chief Green Mantis, after having heard of the attack, personally went after Tu-an. 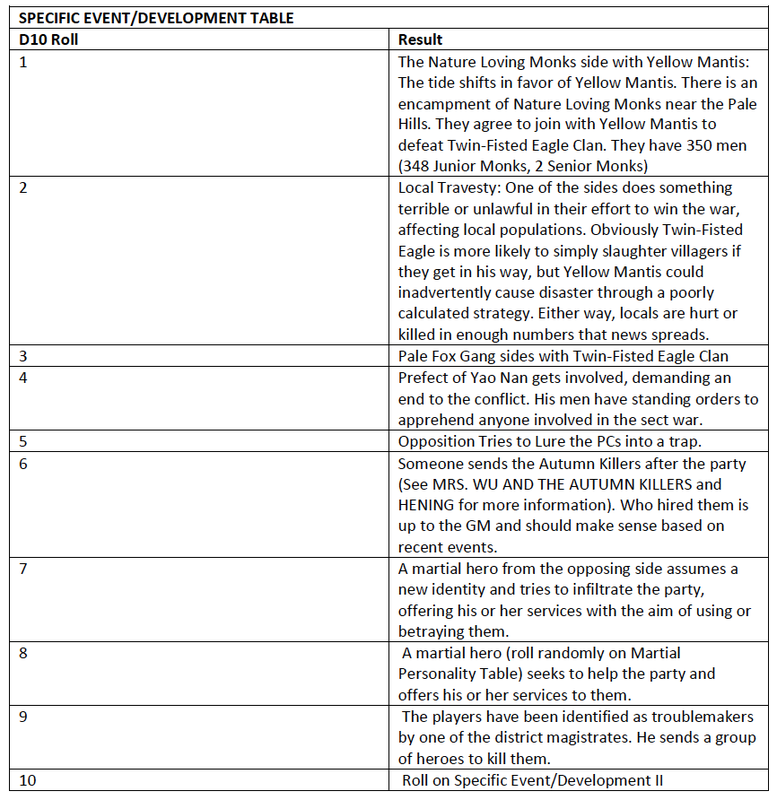 Yellow Mantis killed five of Tu-an’s men, then beat him senseless for his crimes. He threatened to kill but was persuaded by Green Mantis to show mercy. As punishment, Green Mantis took his stick and used it to painfully sever the arms of Tu-an. Yellow Mantis’s men brought Tu-an back to Twin-Fisted Eagle hall and when Twin-Fisted Eagle saw the mutilation inflicted upon his son, he smashed in their skulls with his meteor hammer. He was enraged. His children were his greatest source of pride, their martial talents an extension of his own glory. His son, once a great swordsman, would never hold a blade again. He immediately sought the best footwork and kicking experts he could find and had Tu-an training for revenge. From here things continued to escalate. Twin-Fisted Eagle began targeting Yellow Mantis’ heroes for death, and Yellow Mantis returned the favor. Both halls used to have nearly two dozen heroes, now they are almost empty of them. Dozens of disciples have been killed. But the feud is only just beginning. This is meant to be a brutal adventure, that emphasizes the dark underbelly of the Martial World, so the Gamemaster should feel free to bring the players in, in a way that matches that feeling. This needs to be tailored to the specific party in question. 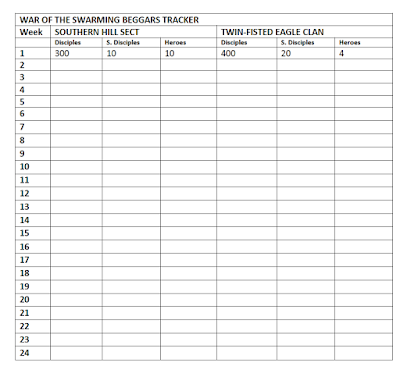 But at the start of the adventure both The Southern Hill Sect and the Twin-Fisted Eagle Clan are equally eager to defeat the other side and looking to gain any advantage they can. It is possible either side reaches out to them. An unorthodox party would most likely be contacted by Twin-Fisted Eagle Clan, while an Orthodox Party would most likely be contacted by Southern Hill Sect. However, keep in mind that Twin-Fisted Eagle is not above deception and would happily invite a powerful group of orthodox heroes, even lie to them about the reasons for the conflict. The reason the party is recruited is both sides would have heard of the players exploits and are attempting the recruit heroes from all over Qi Xien to give them an edge over their foe. If the party is invited to join to join by Twin-Fisted Eagle he will employ manipulation. His preferred method is to create a grudge between the party’s sect (or the party itself) and Southern Hill Sect. He will use whatever opportunity presents itself based on the party and its sect’s recent history. If there is something he can exploit to create a real conflict between them and Southern Hill, he will. Otherwise he takes more extreme action. His favorite method is to send a large statue of Hen-Shi filled with Divine Powder to the sect headquarters of the party, presented as a gift from Southern Hill sect. The gift-bearer then ignites the divine fire and tries to cause as much death and mayhem as possible. The porters immediately attack and kill as many as they can (these would all be Twin-Fisted Eagle Disciples pretending to fight in the style of Southern Hill Sect). It is a suicide mission designed to infuriate the PC’s and draw them into the conflict. Twin-Fisted Eagle then reaches out to the party, saying they share an enemy in Southern Hill Sect. If Twin-Fisted Eagle is trying to gain the loyalty of a group of orthodox heroes, or even unorthodox heroes who don’t seem terribly bloodthirsty he will tailor his explanation to them. Once Twin-Fisted Eagle has the party’s attention he will definitely use his son Tu-an to gain their sympathies. He will point to his precious child, and lie that he was having some harmless fun and beat up some locals (certainly an act worthy of a father’s punishment but not the extreme measures that Yellow Mantis employed). He will try to convince the PCs that Yellow Mantis is a fanatic who harms many innocent people in his constant quest to render ‘justice’. If the party is particularly bloodthirsty, he is blunt and makes clear it is only a matter of time before Yellow Mantis relentlessly hounds them. 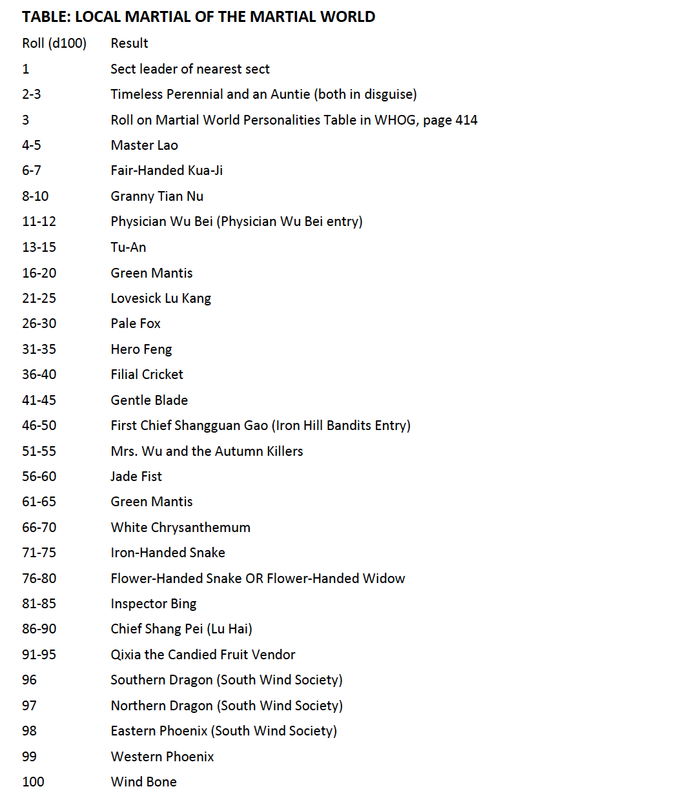 If the party is invited by Yellow Mantis of Southern Hill Sect, he will be more formal, and issue a proper invitation. The invitation will simply say he seeks to bestow honors upon them. As soon as they arrive they are courted by him and his men. He praises them but cuts to the point and says he is seeking heroes to help him defeat the vile Twin-Fisted Eagle Clan. He paints a picture of their many crimes and appeals to the party’s sense of righteousness and duty. Should they refuse and offer good reason for the refusal, he will accept it without argument and thank them for coming. If their refusal is insulting or seems based on selfishness, he will challenge them more harshly and suggest they have a duty to defeat evil clans. It is possible, though not terribly likely, that this escalates. Yellow Mantis is a stern and stubborn hero. A third option is have the sect the player’s belong to be involved in the conflict. 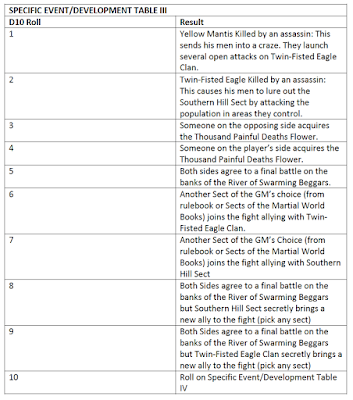 You could even take out Twin-Fisted Eagle Clan or Southern Hill Sect and use the players’ sect instead. It is important to emphasize that the GM shouldn’t force the party to join the conflict if they do not wish to. There is still plenty to do in the area even if they don’t engage the war. But the longer the players stay in the region, the longer the war goes on the greater the likelihood they will get drawn in by events. They might find themselves in the middle of a battle at a local inn between both sides for example, or they could witness a horrible massacre at a local village by Twin-Fisted Eagle’s men. The Gamemaster’s task for much of this adventure is to bring the war between the martial sects in the Swarming Beggars region alive. The more involved the players become, the more they should feel its effects. This is an endless cycle of grudges and bloodshed. As the casualties on both sides mount, more and more members of the sects and surrounding communities will have personal grievances. We provide a number of tools in this chapter to help manage the flow of the conflict, but these can become limitations if the GM relies on them exclusively. This should be imagined as a real feud, with sons, sisters, brothers and fathers being lost. What happens in the setting is important. The tools presented here are meant to lend the conflict surprises and a degree of unpredictability, but the GM needs to breathe life into it. Each week you will be making rolls to determine casualties for both sides on the Weekly Casualty Table. These should be recorded as each week passes so you know the state of all sects involved. It is also possible other sects are drawn in, so we will include a blank version of the table as well. This is simply for tracking casualties. Ultimately you have to translate the results into events on the ground. You also need to have the sects react and act accordingly. If Twin-Fisted Eagle has just lost his only two Martial Heroes, he ought to adapt his strategy (whether by recruiting more martial heroes, or trying to lure the enemy into a trap under the guise of negotiating a peace). Picture yourself as the leader of each sect and consider how he would behave when news of the latest losses reaches him. Also keep in mind while these appear as numbers here, for the sect these are individuals. You will need to determine which heroes are killed and how that person’s identity impacts the sect. You will roll once a week for casualties. Occasionally you will roll more if there is a big battle. If you are rolling for a big battle, roll twice for casualties. If you are rolling weekly, just roll once. 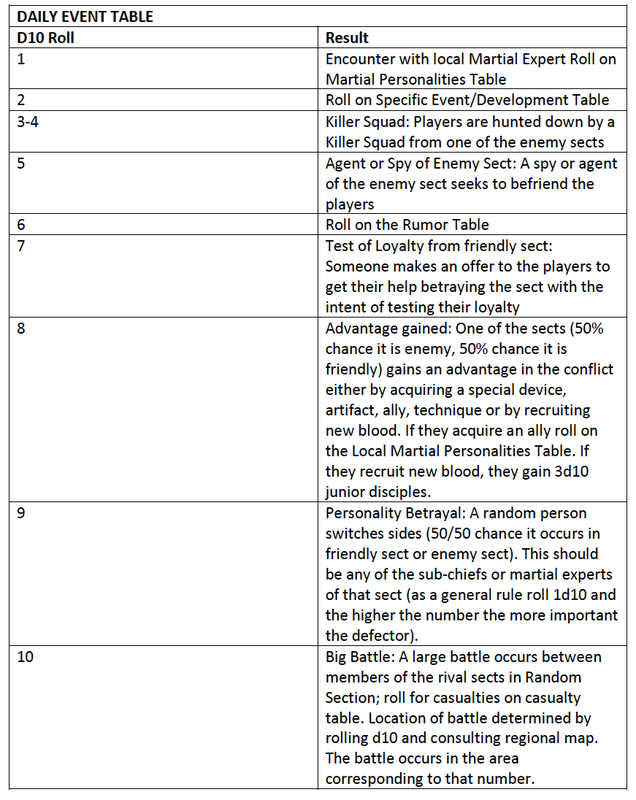 How to roll for casualties: You roll for both sides and whoever gets the higher result is the winner, whoever gets the lower result, the loser. If there is a tie you should re-roll. You then roll 1d10. The winner takes the result from the winner table, while the loser takes the result from the loser table (they should both be working off the same numeric result). 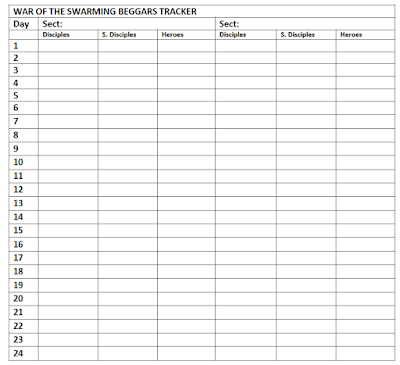 If the players become involved in the War of Swarming Beggars, then you should roll on this table daily. The result should be weighed against any preparations the players themselves take. But with the sect war in full force, regular attacks from either side become a normal occurrence. 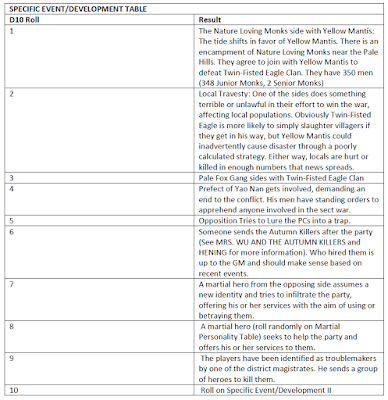 Some events on the table can only plausibly occur once (for example the Nature Loving Monk Sect siding with Yellow Mantis). If you roll an event such as this, simply re-roll. Also, specific things the players do can sometimes thwart results or prompt them without a roll. News of events travel fast in the martial world. So long as they go to places associated with the Martial World (Inns, Wine Shops, Brothels, etc), they will hear word of these events soon after they occur. Roll on this when it comes up on the Daily Event Table. Try to work it in naturally, having locals or some person who knows about the martial world give them the information. Qixia the Candied Fruit Vendor is a possible source of such rumors. Killer Squads are just configurations of disciples and sect members. For example, a killer Squad for Southern Hill Sect might consist of Green Mantis, 4 Junior Disciples and 1 Senior Disciple. Other squads may have more martial experts in them. 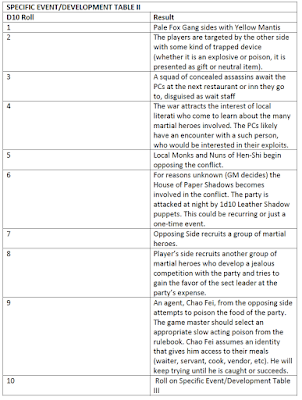 Occasionally the GM may need to assemble a group of Martial Heroes to oppose the party, or to help them. Just as someone sought ought their assistance in the sect war, other martial heroes may be hired or allied with. 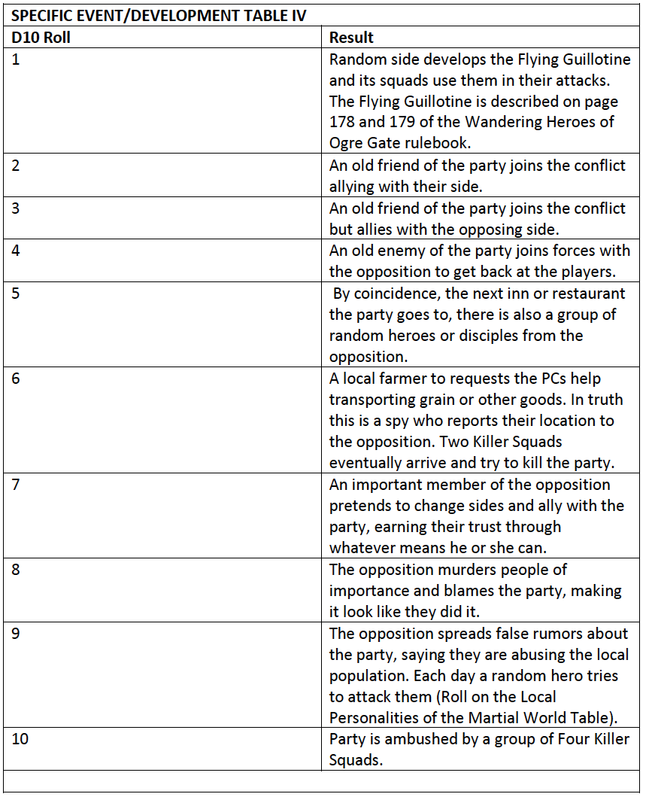 Use this table when martial personalities come up on the events of encounter tables. 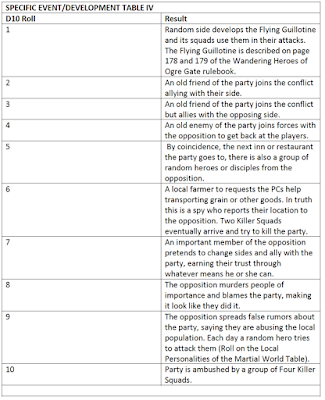 Keep in mind some NPCs are described in the NPC section, some are fleshed out in relevant entries in the Gazetteers (relevant entry is in parenthesis). Individual Battles could involve many martial heroes and disciples (even armies). For these use the following guidelines. 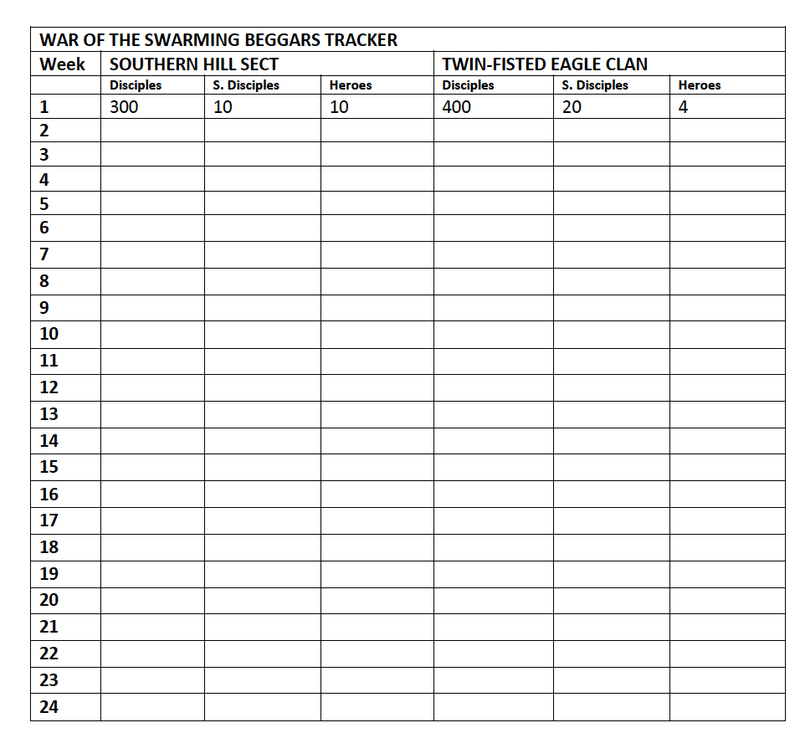 Big battles are likely to happen in The War of Swarming Beggars. There is even the potential for a scenario involving over one thousand on each side. For such situations you can use miniatures and play out the battle or resolve it with the Mass Combat rules from pages 101 to 102 of the WANDERING HEROES OF OGRE GATE rulebook. 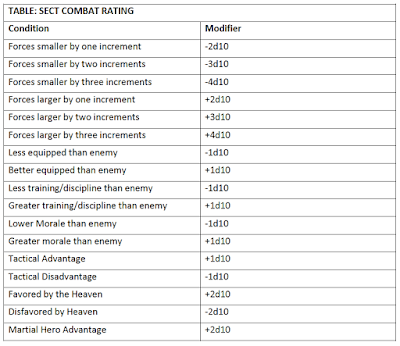 However, because of the likelihood that many Martial Heroes, or even Profound Masters are involved, we suggest using the Sect Skirmish Combat tables below. These use the same basic principles of the Mass Combat rules but afford greater weight to the presence of Martial Heroes and are meant for combat scales between normal combat and warfare (between 50 to 6,700 participants). These rules are here to aid the GM and players. As a general rule, Mass Combat is a fusion of large scale conflict and regular combat rounds. Treat the actions of martial heroes more on the regular combat scale and treat movements of troops in the background. In addition to attacks from Martial Heroes, player characters are usually each attacked a number of times equal half the strength of the army (so an Army with a Strength of 6 would result in 3 attacks on each player character). In this system each side has a Combat Rating and Sect Strength. The combat rating is how many d10 you roll in a given phase of combat. The Sect Strength is effectively the health of your army which is set by the number of disciples and martial heroes you had. When you lose a phase of combat, your Sect Strength Decreases and you lose men. When two sides collide in battle, they each make Combat Rolls. 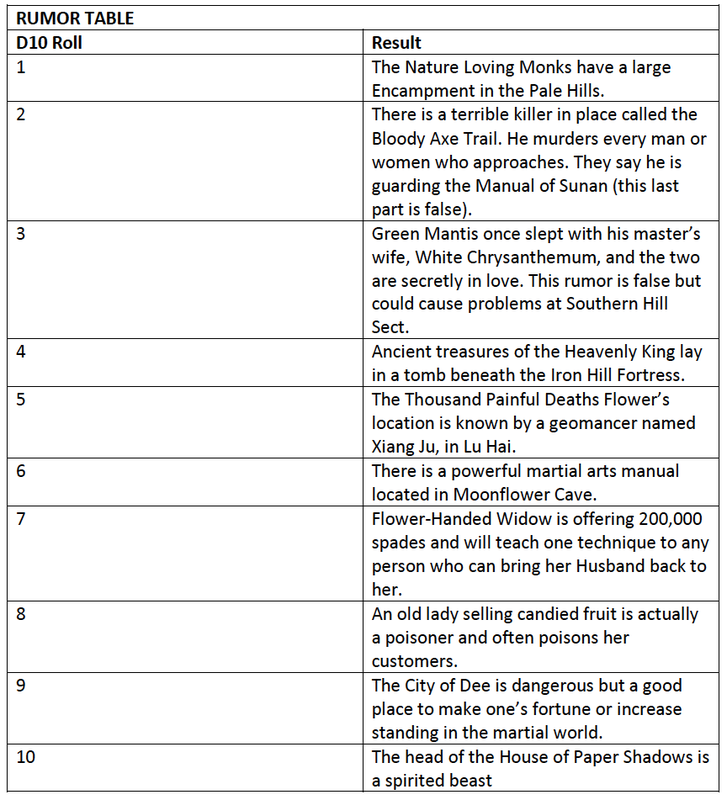 This is a pool of d10 determined by your Sect Combat Rating (see below). Whoever rolls higher succeeds. On a Success the winning army inflicts casualties on the other. Deduct 1 slot from the opponent’s sect strength (always from the Disciple Strength first). The corresponding number of men are lost to death, wounding, flight and capture. On a Total Success the winning side either inflicts double normal casualties (deducting 2 slots from the opponent’s sect strength) or inflicts 1 casualty on Martial Heroes. Combat involving player characters and NPCs fighting them should be handled normally (the rolls are for deaths going on in the background). The Combat Rating is what you roll each phase of combat. 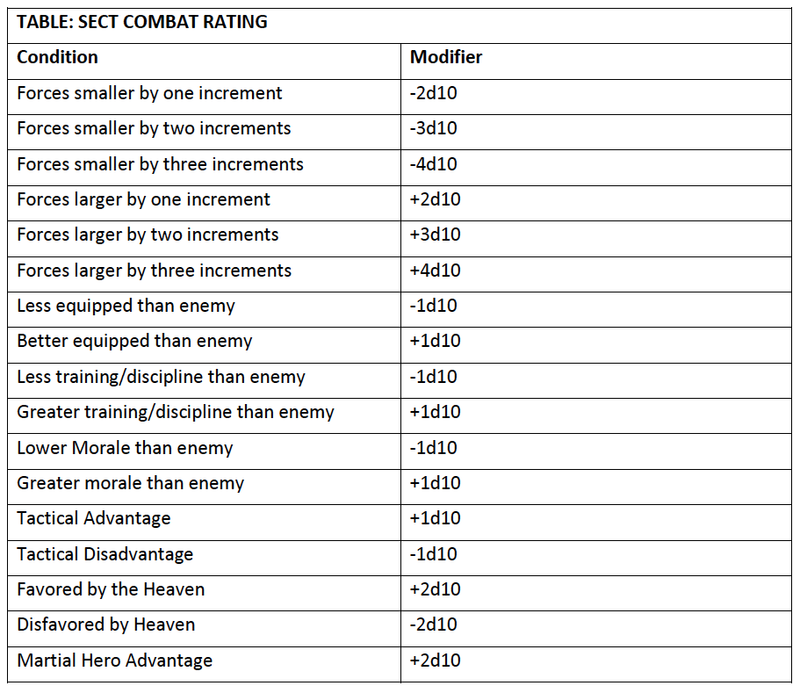 The Combat Rating is determined by adding or subtracting the following modifiers for each side from a base of 2d10. This gives you between 0d10 to 6d10 (never exceed the 6d10 cap). 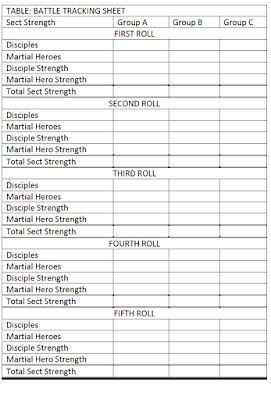 Sect Strength is similar to Max Wounds but for your army of disciples and martial heroes. It ranges from 1-20 and is a combination of your Martial Hero Strength and Disciple Strength. 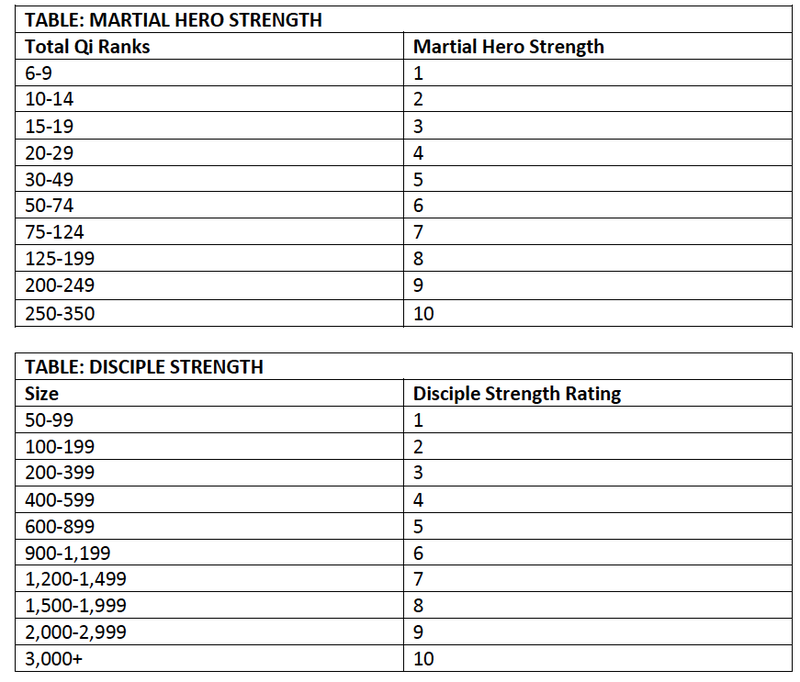 To use this system, add together the total number of Qi ranks of all martial heroes on each side (excluding Qi Heroes Qi rank 1-2). This gives you your Martial Hero Strength rating. 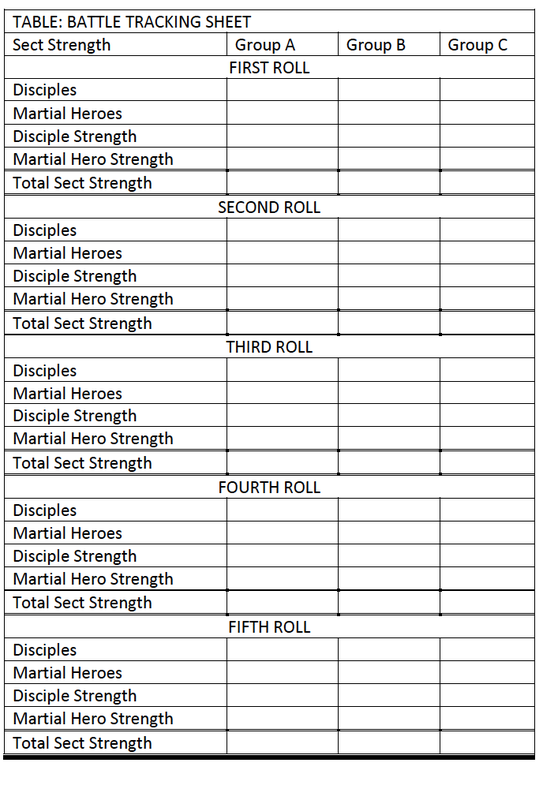 Then add the number of disciples/soldiers on each side and determine their Disciple Strength Rating. These give you’re your Strength Rating for the battle (it is like Health for your forces). 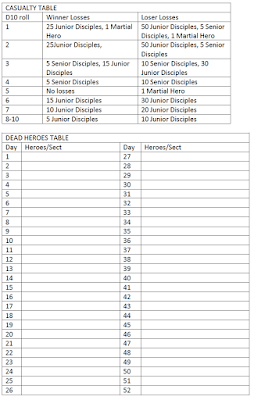 Even thought the numbers are added together, you deduct from your Disciple Strength first (Heroes generally are the last to fall). Not all losses incurred in the battle mean fatalities. In particular, heavily outmatched Sects are likely to take severe casualties, while losses incurred by the heavily favored sect are more likely to be the result of retreating or temporary wounds. After the battle, compare the relative strengths of the sects involved on the table below. 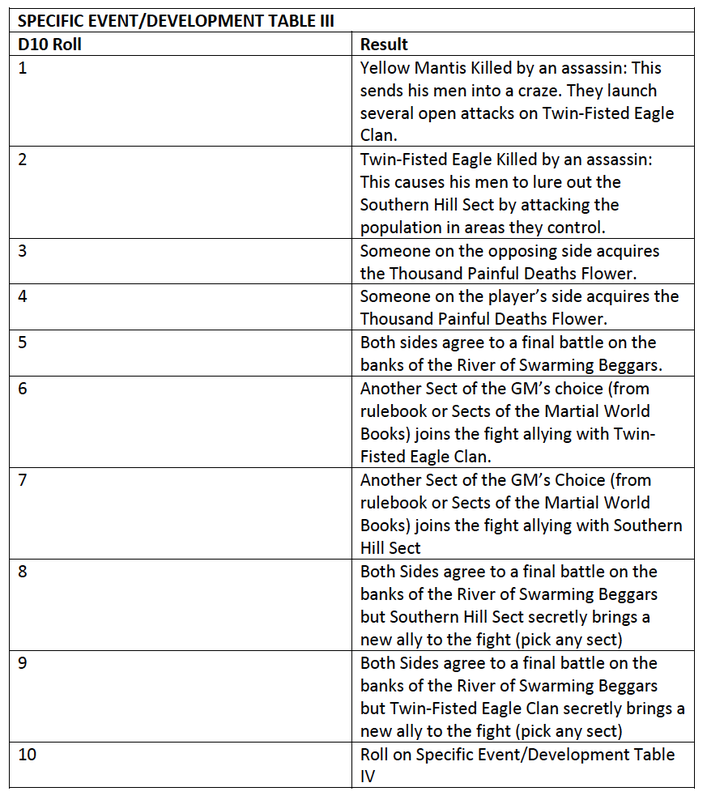 This helps you to determine what the state of each Sect is like after the combat is completed. Note: This table is provided as an aid and as a starting point for the GM only and numbers have been left at easy-to-calculate values. Based on the particulars of the individual battle, adjusting the actual casualties to fit your individual battle is strongly encouraged. To calculate this number, take the Sect Strength of the side that you wish to calculate casualties for, then subtract the Sect Strength of the opposing side. Negative numbers indicate that their foe was stronger than them, making them more likely to take heavier casualties. Killed: These disciples could instead be Incapacitated if their foe chooses to spare them. Captured: These disciples have fallen into the hands of their enemies, who can choose to take them prisoner, release them, or even kill them. These disciples are either demoralized or wounded. In either case, they may recover and rejoin the sect in time, depending on the circumstances involved. 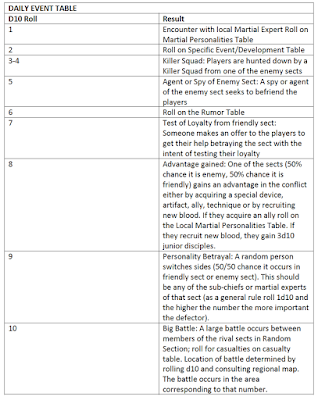 Copy and print several copies of this so you can track battles from Combat Roll to Combat roll if needed. If you don’t want to mess around with tracking fallen foes and rolling round to round, use this simple approach. 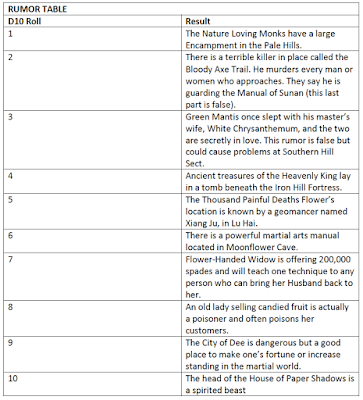 Assign each side of a given battle 0-6d10 based on their strength, advantages, etc. Then have each side roll. The one that rolls highest wins the battle. If the winner gets a Total Success, it is an especially resounding victory with many deaths. This method can also be used on a more fine scale. 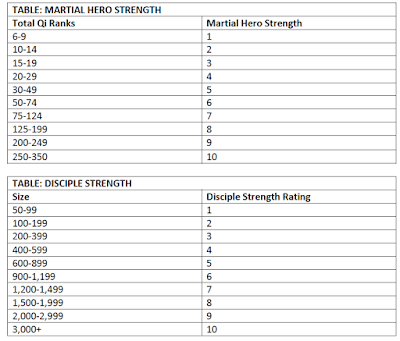 For example if you have a large battle with a number of martial heroes and you don’t want to play out the combat of every NPC but you want a sense of what is happening each round, you can assign each major NPC Martial Hero a combat a pool of d10 equal to their Qi rank (adding +1 to the result for every rank over 6 if you don’t want the pools getting too large). If the NPC is particularly effective due to tactics or technique, you can assign a +1 to +2d10 modifier (and a -1d10 to -2d10 penalty for poor tactics or techniques). When two NPC Martial Heroes clash in combat, simply roll their pools against one another and whoever rolls higher incapacitates the other (killing them on a Total Success). If you want more granularity, you can roll off each round, with the winner being the best 2 out of 3. The point of all this is to have a fair and consistent method for determining the outcome of background events or peripheral combat.